Contain activated charcoal to absorb odor-causing agents and neutralize smells naturally. The filter's holding case is easy to attach with double-sided tape (included). Simply expose your filter to sunlight for 3 hours every 4 to 6 weeks to recharge. Fits perfectly under trash can lids, as well as in cabinets, refrigerators, and pantries. Date wheel keeps track of when to replace your charcoal filter. Hi, Thank you for your review. We have some tips that we hope will help ensure that the filter kit works to its best ability. The carbon filter may need replacing every 4 to 6 weeks, but you do not have to buy a replacement simply expose your filter to sunlight for 3 hours to recharge. We would also advise to use try and keep rubbish from getting stuck and creating mould on the filter, by changing the liner before the rubbish fills over the liner bucket. Fit nicely and seem to stick well. I thought this would be great but unfortunately it didn't turn out that way. The adhesive was not strong enough to hold it to the lid. I did not notice y it had fallen into the trash and tossed it out with the trash ! So disappointed ! This holder does not adhere! I put it inside the lid and I did not notice that it had fallen into the trash. Very disappointed with this product. I lost the holder and the filter! Here are some tips for the best results: i. 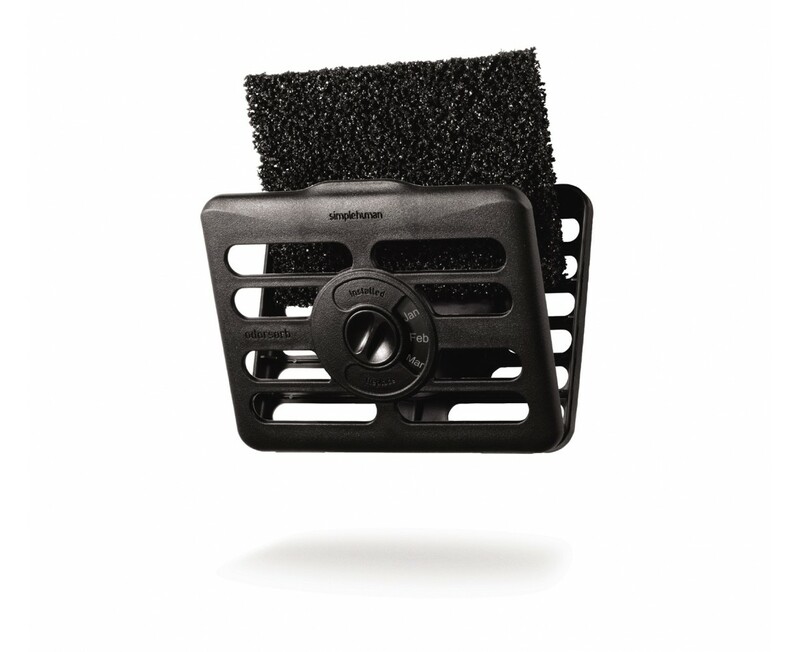 Clean the mounting surface with degreasing cleaner ii. Clean the surface using rubbing alcohol iii. Press the cage (adhesive tape) firmly onto a flat surface for at least 30 seconds. A product specialist has contacted you and will be sending you a replacement odorsorb filter kit along with refills. Depending on what you put in it, may work well. 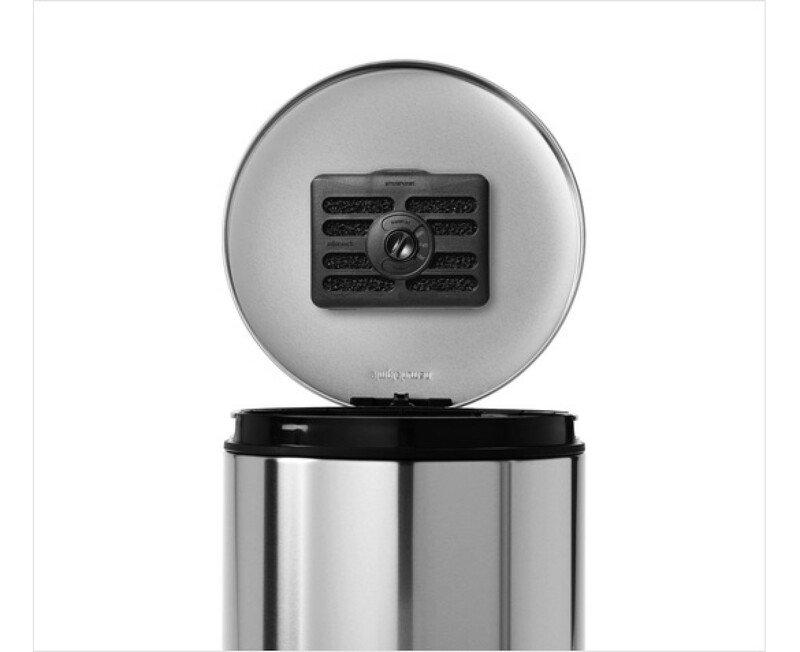 Instead of deodorizing our trashcan, which is an actually dog-proof as advertised, can from Simplehuman, the holder kept opening up and dropping the absorbent pad into the trash. After a couple of pad were inadvertently tossed into the garbage can with the rest of the refuse, I had no more pads, decided not to reorder and threw the hold into the trash. Here are some tips for the best results: i. Clean the mounting surface degreasing cleaner ii. Clean the surface using rubbing alcohol iii. Press the cage (adhesive tape) firmly onto the surface for at least 30 seconds. A product specialist has contacted you and will be sending you a replacement odorsorb filter kit along with refills. Great product fits under the lid perfectly to capture those unfriendly odors. Love It! This is a real Filter and one of the best invention. All garbage cans should have this filter. We love it. I really like the odorsorb filter kit. It makes my trash can smell clean and fresh. I purchase them again in the near future. The double sided tape is not sticky.... This is my second one both ended up in the trash because the tape didn't hold. Thank you for your feedback. A customer service representative has contacted you to further assist you with this matter. These great filters and filter kits by Simplehuman are wonderful for kitchen trash cans, especially. I highly recommend them. I put it on my kitchen garbage cat lid. It started helping immediately with the stale smell. I love it. Works just like it said it would. Works like a charm to remove odors! I would highly recommend it! I'm naturally a skeptic, and so many of these little household items just don't live up to their claims, so I bought it with a healthy dose of ambivalence. But waddaya know ... it actually does its job and does it well. The smelliness really HAS gone away. Shocker. I originally bought this for my trash can but ended up using it in my closet to get rid of funky shoe smells. Very unassuming little filter that does a lot of work. It doesn't add scents to the air like a lot of odor absorbers. This helps keep the kitchen smelling good even with onion peel in the can. Filter helps keep kitchen odors down. I had a cat litter box with carbon filters and it helped keep odor under control. When I saw this I didn't know if it would work, especially since we cook a lot and sometimes there's food in the trash. It has not smelled like garbage at all. My only mistake was sticking it right in the middle! Try to stick it a little more toward the top edge of the can so that its not opening or getting in the way when you are trying to change the liners/bags. The charcoal filter would not adhere to the dome top of my simplehuman trash can so it's usless. It should have been noted when I put in the serial number of my trash can, but it wasn't. Also the filters are of no use to me either. It would probably cost more to return them for a refund that it's worth. I feel I should hve been told that these items would not adhere to the top of my simplehuman trash can. The sticker was too weak! it fell in the can and was taken out with the trash in the first few days of use! The odor filter kit did not stick to the lid of the trash can but the bags for the trash cans are great and fit well-- I would recommend them to anyone with the small trash can. A surprisingly effective little device! We are using it for kitchen garbage odors and for the diaper trash can. Both are working very well to keep odors at a minimum. (Honestly there really is no eliminating diaper odor completely.) The container is easy to install. It is small and stays out of the way. I have a big trash can from simplehuman, so this filter's size is perfect. It does its job, and it's barely noticeable (unless I keep the lid open all the way). I don't usually have smelly garbage, but I still smell it just as if I never bought this product. Must work, there's no stink when I open the lid to my garbage can. Easy to install, still sticking to lid.